The most important thing to do when preparing to travel is to plan out as much as possible and create a detailed itinerary. This will not only help you make sure to visit and do everything you’re excited about, it will also help your loved ones back home keep track of what you are doing should anything go wrong. All in all it is just a good idea to have at least a basic travel itinerary and this travel itinerary template is exactly what you need to make a good one quickly and easily. The biggest benefit of using this travel itinerary template is that the entire thing is free to use so it is not like you are wasting any more to get started. The whole thing is also customizable so you can add or remove as many things as you want to make sure it completely covers what you will be doing on your upcoming trip. It really is an easy and efficient way to make a simple travel itinerary before you leave, plus if you print it out it is a handy way to keep track of what you’re going to visit while on vacation. 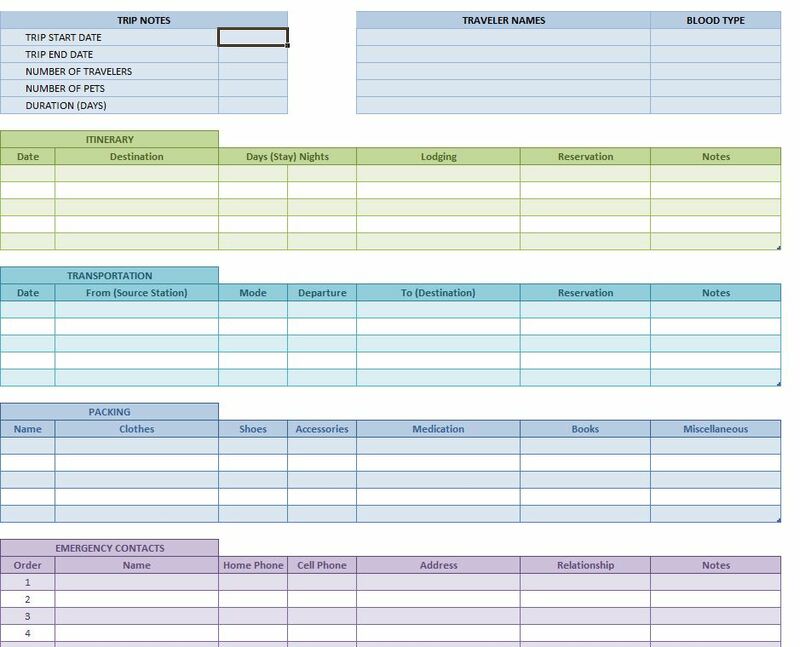 Using the travel itinerary template is remarkably easy; all you have to do is open up the template and start filling in the boxes. Important things like dates, traveler names and the duration of your trip are located right at the top. Below that you will see various boxes for transportation, lodging, and even a spot to list anything you’ve packed to take along. It is also a good idea to fill out the emergency contacts, even if you don’t need them it is nice to have just in case. After you fill in the travel itinerary template you are pretty much done with everything, just print it out and keep it in a safe place for your trip. The entire travel itinerary template is incredibly easy, it is free to use, and it takes only a few minutes, so why not try it out and make a simple itinerary for your upcoming vacation? I’m planning a church family kayak trip, and would love to have a template to go by and use.